The Mid-South Scholastic Art Awards is an annual juried student art exhibition presented by the Brooks Museum League and the Memphis Brooks Museum of Art. Click here to view the list of the 2019 Mid-South Scholastic Art Awards Winners! Click here to view the list of the 2018 Mid-South Scholastic Art Awards Winners! Click here to view the list of 2018 National Gold and Silver Medalists! What are the Mid-South Scholastic Art Awards? 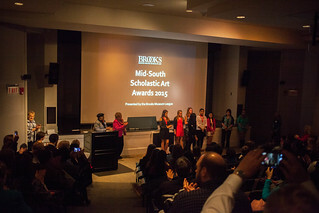 The Mid-South Scholastic Art Awards began in 1965 as the Junior Mid-South Exhibition. Since 1989, the Brooks has been proud to partner with the Alliance for Young Artists & Writers, a national non-profit organization, to host the regional competition and exhibition for Memphis and the Mid-South area. More than 2,000 entries in a wide variety of categories, including painting, drawing, mixed media, photography, sculpture, graphic design, film, fashion, as well as senior art portfolios are judged by a panel of judges over a course of several days. Judging for the competition takes place digitally, through a blind adjudication process involving a panel of regional artists, art educators, and other arts professionals. Regional winners are eligible for scholarships and cash prizes, are part of the exhibition at the Memphis Brooks Museum of Art, are invited to participate in an awards ceremony at the museum, and have their work sent to New York City for national judging. You may begin submitting works for the 2019 Mid-South Scholastic Art Awards on Wednesday, Sept. 12, 2018 at artandwriting.org. The deadline for 2018-19 Mid-South Scholastic Art Awards submissions is Thursday, December 13, 2018. Click here for a calendar of important dates. Students in grades *7-12 may submit exemplary visual artwork to the Mid-South Scholastic Art Awards competition. Newly created works of art created from January – December are preferred, however works that didn’t win any awards last year may be re-submitted with significant alterations. Previously awarded works CANNOT be re-submitted. *must be 13+ years of age on or before December 13, 2018. All submissions must be completed online, at artandwriting.org. Paperwork must also be turned in, along with fees, to the Memphis Brooks Museum of Art. For more information about submitting works online and the complete submission process, please see our Mid-South Scholastic FAQs and School Submission Checklist. Graduating seniors may submit up to two portfolios of work to be considered for awards and for scholarships. Students should submit works that best exemplify originality, technical skill, and the emergence of a personal vision or voice. Regional and national jurors are often looking at the consistency of the work across the portfolio and an emergent style that is unique, personal, and expressive. Senior portfolios are also reviewed for scholarship consideration by several area colleges and universities. When is the regional celebration and exhibition? The 2019 Mid-South Scholastic Exhibition will be on view Saturday, January 26 – Sunday, February 24, 2019. As of the 2016 program year, only Gold Key winning artworks will be included in the exhibition. The awards ceremonies will be held on Saturday, February 16, 2019 at Memphis Brooks Museum of Art. All award winners: Gold Key, Silver Key, and Honorable Mention, their families, and teachers are invited to attend the awards ceremonies. There are three separate awards ceremonies, divided by age. May I bring my class to view the exhibition? Yes, we would love to see you at the Brooks Museum. To arrange a free, self-guided tour of the Mid-South Scholastic Art Awards, please contact the museum’s tour coordinator at edu@brooksmuseum.org or at 901.544.6215. The tour schedule fills up quickly during this popular exhibition, so call early to make your reservation. The 2019 Mid-South Scholastic Exhibition will be on view January 26 – February 24, 2019. The Mid-South Scholastic Art Awards and the Alliance for Young Artists & Writers, the national organization that organizes the National Scholastic Art & Writing Awards, take plagiarism very seriously. For a copy of our policy on plagiarism and information about how to avoid it, please click here. On the regional and the national level, jurors consider the following criteria when evaluating artwork submitted for consideration: Originality, Technical Skill, and Emergence of a Personal Style or Vision. For more information about these criteria and the judging process, please visit http://www.artandwriting.org/the-awards/faq/ . Click here for answers to regional Mid-South Scholastic FAQs. Be sure to download the appropriate regional forms to complete your Mid-South Scholastic Art Award submissions.